This now has the SIO fix.Here we have the excellent Atari SDrive-Max. This works just like the sio2sd but better, It has a touch screen for easy use and emulates 4 disk drives and the tape deck. This is now supplied with a 16g sandisk sd card with everything needed to get going. The 2N1613 transistor was the first planar device ever produced. All are in excellent collectible condition. Photos were taken under standard room lights andare not color enhanced. Silicon wafer colors are caused by diffraction of light and will change dramatically depending on viewing angle and lighting conditions. 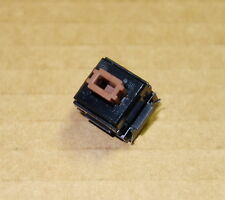 1 Propeller - Parallax P8X32A-D40 - 40 pin socket. - Parallax Prop Plug USB cable. What you will need and isNOT part of this kit - 1 65C02 - Western Design Center W65C02S6TPG-14 - 40 pin socket. DIGITAL TAPE DECK/RECORDER FOR COMMODORE 64/128, VIC 20. Options : - Machine ( C64, VIC, C16 ). SD CARD - Full of software. On a screen on your computer should be " PRESS PLAY ON TAPE ". Press button [ C= ] and button [ RUN STOP ]. What makes this solution is the level of emulation you can reach: it’s really perfect and you can load whatever software for Commodore 64/128/Vic20/16/Plus4 as the real floppy drive. - Raspberry Pi 3B with 2.5A power adapter. Sinclair ZX Spectrum 48 48K modifié sortie video composite. - Micro guide ZX Spectrum. - ZX Spectrum Micro guide. Testé OK (clavier, video, son). Tested OK (keyboard, video, sound). Voilà c'est mon point de vue, et je pense qu'il est compréhensible. This interface allows you to connect an IDE peripheral (HD, CF interface.) inside your Atari STE and enjoy a Hard drive. je vends cette interface IDE pour Atari STE. Une disquette contenant une version de driver gratuite pour l'interface est fournie. Rare Vintage Eagle 2 Computer PC. Shipped with USPS Parcel Select Ground. This is a really rare, unique and amazing computer from the early 80's. This is a "portable" version in which the keyboard fits into the box flat to ease transportation. I honestly don't know much about the workings other than to say it turns on and appears to work. This is great for anyone interested in early computer technology!! I'm not sure what it's worth so feel free to send a offer or provide education. I am pricing purely on what similar computers have sold for already. Then going much lower due to the unknown system health. Thanks for looking and feel free to contact with questions or for additional photos. If you’re into 8Bit Commodores and you haven't yet got one of these, you are missing out. TFW8b SD2IEC – The SD2IEC emulates the basic functions of a real disk drive. TFW8b SD2IEC is the world’s most popular SD Card reader for Commodore 8bit Computers #FACT. Envoi suivi en France à votre responçabilité. Works on both PAL & NTSC Commodores. Second drive fully supported. On screen help is available while the program is running. Complete instruction manual on aligning both 1541 & 1571 drives. 's Gazette, December 1987. Datassette für Commodore 64/128 NEU!! Tape Deck For Commodore 64/128 NEW! I found this old school Apple IIc plus in a room in an old house that had been closed up for many years ! The outside of the carrying bag is dirty from sitting around in a closed up room for decades. 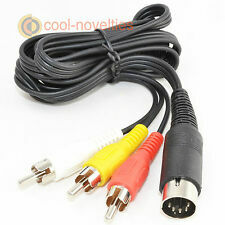 Cavo RCA Audio/Video Commodore 64, C64C, C16, C116, PLUS4, C128, SX-64, VIC20. What makes this solution is the level of emulation you can reach: it's really perfect and you can load whatever software for Commodore 64/128/Vic20/16/Plus4 as the real floppy drive. - Raspberry Pi 3B with 2.5A power adapter. This is a 3D printed enclosure or case including reset buttons for the Amstrad CPC m4 Board expansion by Duke. This is a quite a nice case and protects your expansion board as well as making it look better and match your Amstrad CPC better too! GEORAM 512 RAM Expansion Unit by Berkeley Softworks for Commodore 64 & 128. For everyone who's ever waited a tad too long for a GEOS screen to redraw itself or an application to load, congratulations. All keys and mouse are functional. SONO PRESENTI 2 PULSANTI PER LO SWAP DISK ( GIOCHI A PIù DISCHI ) OLTRE AD UN PULSANTE DI RESET PER RESETTARE L' EMULATORE. STATUS LED E READ/WRITE LED. È possibile utilizzare questo dispositivo per caricare i giochi su un computer commodore senza la necessità di un disco e un drive floppy. Amstrad 6128 PLUS Floppy Disk Drive Emulator BRACKET MOUNT Gotek USB. Adaptor for mounting a Gotek floppy disk usb emulator drive in your Amstrad 6128 computer. These are 3d printed so have a few rough edges but as you can see in the photos, they look very good and are a very secure and non-destructive way to mount your Gotek drive. A 6502 programmable calculator mode is added as an extension of the original KIM. Despite its small size (similar to just the keyboard/display area of the original KIM), the Uno provides a faithful KIM 'experience'. At least 2MB Chip RMA and 4MB FAST RAM Expansion (8MB for optimum WHDLoad performance). ClassicWB OS. 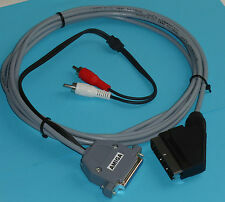 For this to work on a real Amiga 600 you require the following 44 PIN IDE cable (to plug into your Amiga’s IDE hard disk socket on the motherboard). Mouse pad features the image shared with the 3dfx Voodoo 5 5500 video card box, and has the 3dfx 3M logos in the corners. The mousepad is made of a thin material and features a grooved top surface. KA02 uses high quality gold plated socket with pins of different lengths, as required by PCMCIA standard, so it retains hotplug feature of PCMCIA. 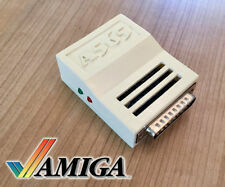 Therefore cards may be inserted in KA02 socket when Amiga is turned on. Drakware ADB2USB. 1 ADB2USB adapter. Plug your old Apple (or NeXT) ADB keyboard into USB! No need to open up the old board or solder anything, this adapter has a Mini-DIN 4 connector for your ADB keyboard and provides a micro-USB connector to plug into your modern system. Abdeckung für C-64, neu. Dust cover for Commodore 64, new. Abdeckung für C-64 (Breadbin), C-64G, VIC-20, VC-20, C-16. Das Material ist Riss- und bruchbeständig. Here we have the great TZXduino / Casduino for the ZX Spectrum, Amstrad 6128, MsxThe tzxduino works with the Zx Spectrum, ZX81 and Amstrad and acts like a tape deck.The Casduino works with the Msx computer and the Dragon 32/64. The new KMTech USB to MSX mouse adapter. Roland Users This is the USB version.